Royston Drenthe moved abroad in August 2007 for a record fee of 13 million euros signing a 5-year contract. He just played one season in the first team of Feyenoord but his magnificent play in the European Championship U21 was good enough for Real Madrid. He joined the club together with Dutchman Wesley Sneijder. In the 2009 summer transfer period, Drenthe was on the move for a loan spell at Italian club Fiorentina. Both clubs were agreeing the final terms, but the deal collapsed at the end. In the 2009-10 season Drenthe appeared minimal times for the first selection. In August 2010 he moved to Alicante on a loan period for the 2010-11 season. After some brilliant matches where he scored for the just promoted club, he failed at the end to make himself a hero for the club. Hércules directors caused salary problems who Drenthe refused to accept. He returned disappointed back to Madrid after the relegation. His contract at Real lasts until June 2012. 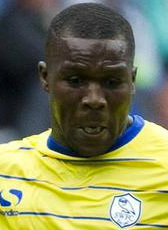 Just before the closing of the summer 2011 transfer window, Drenthe was captured by Everton on a season loan deal. At the end of the 2011-12 season he was out of contract. Everton was not offering him a contract on a permanent deal and therefore he became available on a free transfer. Finally in January 2013 he found himself a club. Drenthe moved to Russian club Alania Vladikavkaz on a 3,5 year contract until mid-season 2016. After a half season, he could not prevent the club from relegation. In June 2013 he agreed a two-year contract to join Championship side Reading on a free transfer. After a season without many matches, he moved to Sheffield Wednesday on a loan season until the end of his contract in June 2015. In January 2015 his contract was cancelled and Drenthe moved to Turkey to sign a contract until June 2017. However after a few months he also cancelled his contract in Turkey. In September 2015 Drenthe signed a one-year deal at Baniyas SC in the United Arab Emirates. He left the club in July 2016. Drenthe announced in February 2017 his retirement. In July 2018 Drenthe returned to professional football joining Sparta Rotterdam for the 2018-19 season.